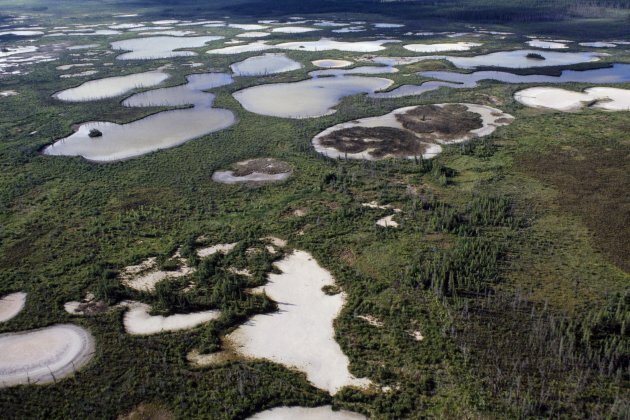 One of the world’s largest groups of conservation scientists says Canada’s biggest national park is among the most threatened World Heritage Sites in North America. Wood Buffalo National Park is a vast stretch of grassland, forest, wetland and lakes. Its 45,000 square kilometres contain one of the world’s largest freshwater deltas, uncountable flocks of waterfowl and songbirds, as well as ecological cycles and relationships that remain in their natural state. It’s also the nesting site for the last flock of endangered whooping cranes. It is considered to have “outstanding and universal value,” according to its status as a UNESCO World Heritage Site. 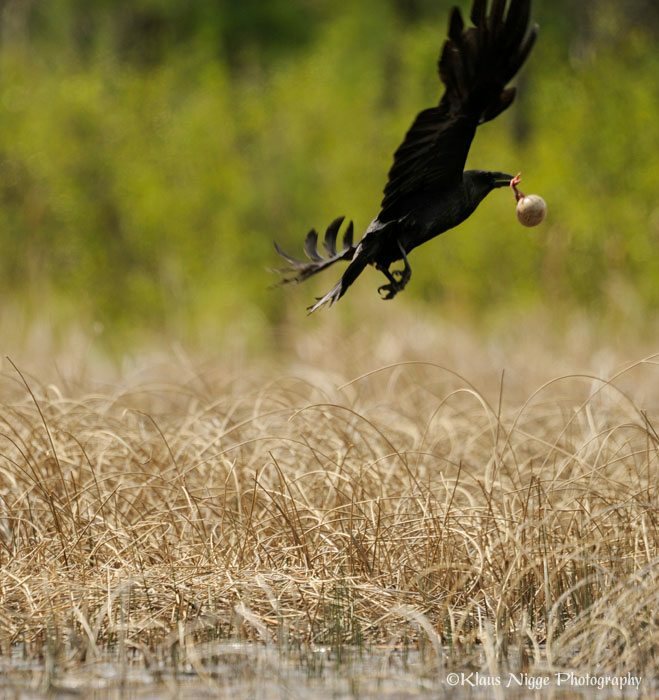 But the nature conservation union, which includes 1,300 member organizations and 10,000 experts, said those values have slipped considerably since the last report in 2014. Only four other sites in North America are as threatened as Wood Buffalo — three in Mexico and one in the United States. Wood Buffalo is the only North American World Heritage Site to have deteriorated since 2014. It’s not the first time Canada has been warned about the future of Wood Buffalo. Last June, UNESCO scientists visited the park at the invitation of the Mikisew. They found the same concerns listed in the report and warned the park’s world heritage status would be endangered unless Canada implemented 17 recommendations. 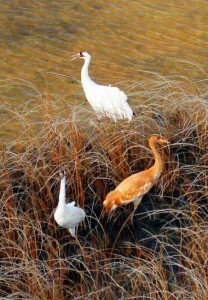 Two adults and one juvenile whooping crane. Photo: John McKinnon / ©2014 Parks Canada /Wood Buffalo National Park. 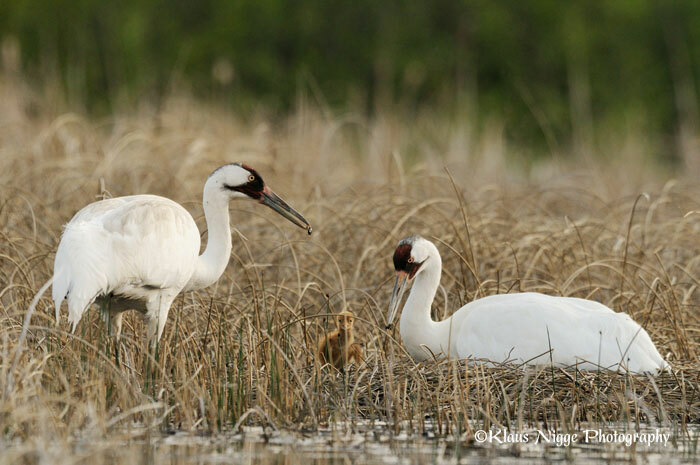 Fort Smith, NWT, August 14, 2017 – A record number of 63 whooping crane fledglings were detected by Parks Canada and Canadian Wildlife Service (CWS) staff during surveys conducted at and near Wood Buffalo National Park with their parents. In mid-May 2017, during the nesting survey, Parks Canada and CWS detected a record 98 nests, which was a substantial increase over the previous record of 82 nests in 2014. Then, during the fledgling survey in late July, we detected 63 chicks in total with 4 sets of twins. The previous record was 49 chicks in 2006. Results are preliminary until analysis of data obtained during the nesting and fledgling surveys is completed by CWS in the fall. The nesting survey is carried out over four days each year in late July. WBNP and CWS staff conduct aerial surveys over sites where nests were detected earlier in the year, to determine which nests successfully produced fledglings. 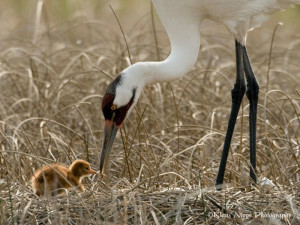 WBNP and nearby areas provide the last natural nesting habitat for the endangered whooping crane. The birds are hatched in and near WBNP each spring and spend the winter at and near the Aransas National Wildlife Refuge in Texas before returning to WBNP the following year. Friends of the Wild Whoopers was expecting an excellent fledgling count because of the record number of 98 whooping crane nests found during the May 18-21, 2017 nesting surveys. Parks Canada, Environment and Climate Change Canada were elated with the results. Mike Keiser of Park Canada had told us earlier that habitat conditions were excellent with most wetland basins being full. So environmental conditions for a great Whooper chick production were established. This important success for the Aransas-Wood Buffalo population is incredible. It is the only wild self-sustaining population of Whooping Cranes on earth and has faced many difficulties over the years. This wild population had only 15 members in 1945 and was on the edge of extinction. Unregulated hunting during the 1800s and early 1900s coupled with widespread habitat destruction was the cause of the Whoopers serious decline. Fortunately with legal protection this decline has been reversed as witnessed by their continued increase in numbers during the past approximately 65 years. This was the 51st year of annual surveys of the Aransas-Wood Buffalo whooping crane population. The large increase in nests and fledglings chicks from previous years is a result of several things. Very important is the excellent habitat conditions on Wood Buffalo nesting grounds that provided suitable nesting sites for the cranes. The Wood Buffalo staff keeps careful watch over the nesting areas. Importantly, the legal protection by wildlife law enforcement personnel for the past approximate seven decades has been of tremendous benefit. More recently the increase resulted from the arrival at breeding age of the large number of young Whooping Cranes that were produced during the period 2010-2013. 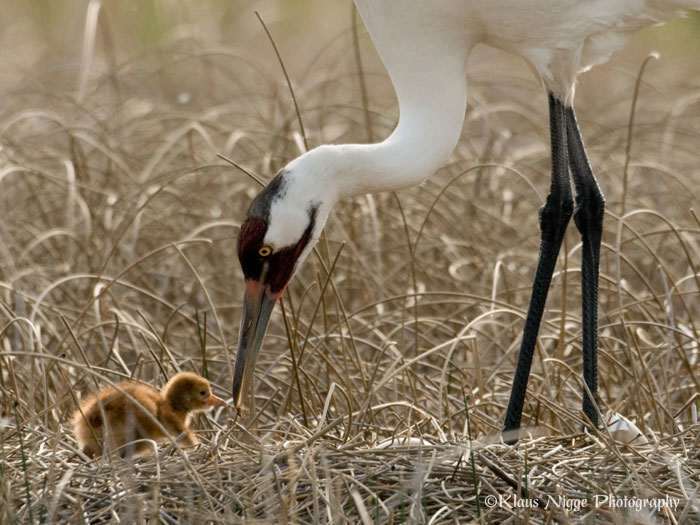 The Aransas-Wood Buffalo wild Whooping Crane population is capable of taking care of itself with two exceptions. These birds cannot protect their habitat nor stop the illegal shooting of members of their population. These endangered birds need man to protect and manage habitat and bring a halt to the illegal shooting. Wild Whooping Cranes on Wood Buffalo National Park, Canada are currently in the important period of incubating their eggs. In fact some chicks may have already hatched. So incubation of eggs and parenting chicks is the current focus of the wild Whooping Cranes associated with their record breaking 98 nests at Wood Buffalo. Attending their nest and incubating eggs is one of the most trying times for the cranes. One member of the crane pair must remain on the nest during most hours of the day. They normally lay two eggs which must be kept warm during the 29 to 31 days of incubation to successfully produce chicks. Importantly the eggs must also be protected from predators including raven, mink, black bear and fox. Mike Keiser of Parks Canada reported on May 31, that a nest survey was accomplished during May 18 – 21, 2017. Nest surveys are a joint effort by Environment and Climate Change Canada (ECCC), [Canada Wildlife Service], Parks Canada, the Government of the Northwest Territories and as a partner, the U.S. Fish and Wildlife Service. This is the 50th year that the nest survey has been done. A second nest survey in July will measure the level of success of the current nesting. The final set of surveys will be done in August to determine the number of young chicks that survived to fledge. Mr. Keiser told Friends of the Wild Whoopers (FOTWW) that habitat conditions were excellent for the nesting Whoopers with most wetland basins being full of water.” Good water levels are needed for a good hatch. This was the 50th year of annual surveys of the Whooping Crane population. Keiser explained to FOTWW that, “The large increase in nests from previous years is a result of two things; the arrival at breeding age of the large number of young that were produced during the period 2010-2013 and the excellent habitat conditions that provided an abundance of suitable nesting sites for the cranes.” This year’s survey located 98 nests, an increase of 16 over the previous record of 82 set in 2014. Keizer elaborated, “2017 also offers an opportunity to celebrate this amazing recovery successes story of the Whooping Crane and take strides to advance protected areas and biodiversity as part of the celebration of Canada’s 150th. Friends of the Wild Whoopers will provide more details about this amazing conservation milestone soon. We will explain how Wood Buffalo National Park field staff and Environment and Climate Change Canada gather this important information and what it could mean for the future of world’s only wild migratory Whooping Crane flock. Whooping it up in Wood Buffalo.